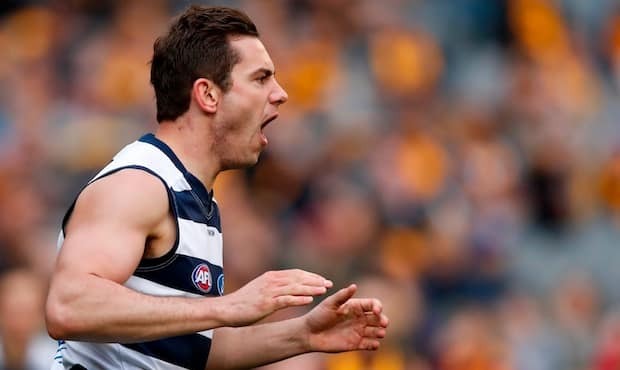 Delisted Geelong forward Daniel Menzel is on Sydney's radar as a free agent. Sydney could offer a lifeline to delisted Cat Dan Menzel, with Swans list manager Kinnear Beatson revealing that the club will put the discarded forward through a medical. Menzel, 27, was surprisingly cut by Geelong last month, despite a healthy record that yielded 100 goals from 50 games with the Cats over the last three years. His manager later suggested that up to five clubs were running their eye over Menzel as a delisted free agent, with Sydney the first to publicly confirm its interest. "There's a possibility," Beatson told SEN.
"Daniel is heading back to Melbourne soon and we will have a medical done on him. Once we've got all the facts, we'll make a decision on which way we go there." Sydney has also contacted delisted Richmond player Jacob Townsend and discarded Fremantle player Cam Sutcliffe regarding a potential move. Both have been put through medicals, with the Swans set to decide whether it will pursue the pair in the coming days. "We're on record that Jacob and Cam came up," Beatson said. "Until yesterday after 2.00pm, we weren't exactly sure who sat in the free agency basket. Now we do, so we can gather all of the facts and work out what we want to do."